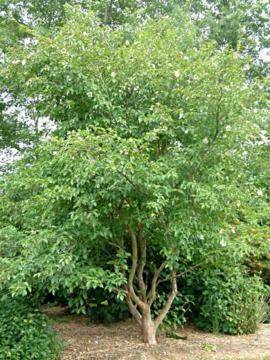 Small to medium sized deciduous tree of open habit and quite quick growing. 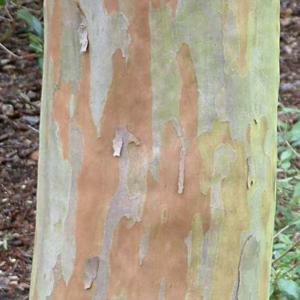 Attractive flaking bark in patches of pink, red-brown and grey. Ovate to obovate, finely toothed leaves which turn yellow, orange and red in autumn. 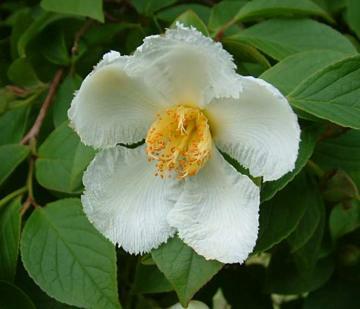 Beautiful camellia-like, cup-shaped white flowers, about 6cm across, with yellow stamens, produced in succession over several weeks in summer. Moist, well drained, reasonably fertile neutral to acid soil in full sun or dappled shade. Best positioned so that the roots are in some shade from hot sun and with shelter from strong winds. Light woodland is ideal. Established specimens resent transplanting. From seed, cuttings or layering. Woodland or sheltered garden. As good autumn colour, the attractive bark is valuable for winter interest.